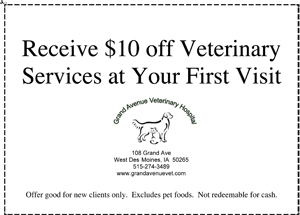 New Clients Receive $10 Off Veterinary Services At Your First Visit. Offer Good For New Clients Only. Excludes Pet Foods. Not Redeemable For Cash. Print Coupon or Show Front Desk when checking in.